As we scurry to get ready for the holidays, it is so easy to forget to thaw the turkey. I know everyone has done it: left the turkey out on the counter on the Wednesday before Thanksgiving hoping it will thaw more quickly at room temperature. It does thaw more quickly at room temperature but Thanksgiving can be difficult enough without a salmonella chaser. Get the bird out of the freezer and into the refrigerator days before the big event. Check your turkey for doneness with a meat thermometer. It should reach an internal temperature of 165 degrees F. Check the temperature in the innermost part of the thigh and wing and in the thickest part of the breast. 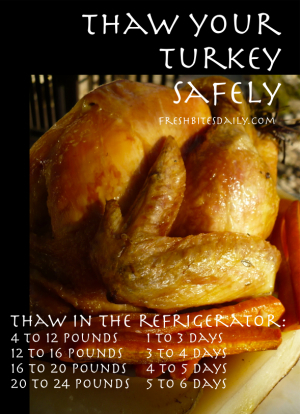 Don’t cook your bird lower than 325 degrees F.
Turkeys are tasty but they are also salmonella factories. Handle with care. 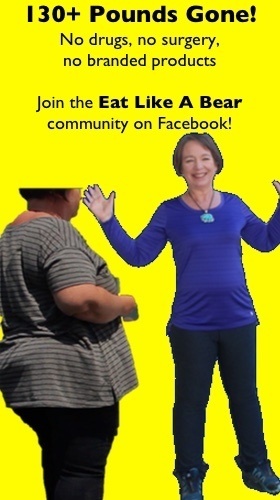 2 Comments on "Thaw your turkey safely — Don’t get more than you bargained for!" I love my mom’s turkey dishes..
It’s one thing I miss every time I am away from home. I forgot Monday AM to get the turkey out of the freezer. Will do it tonight and hope for the best. What about soajing the turkey in brine.